Home > Divisions > Sportsman > Jeff Herzog claims Sportsman Fall Dirt Nationals at I-55 Raceway & earns $7,500 payday! 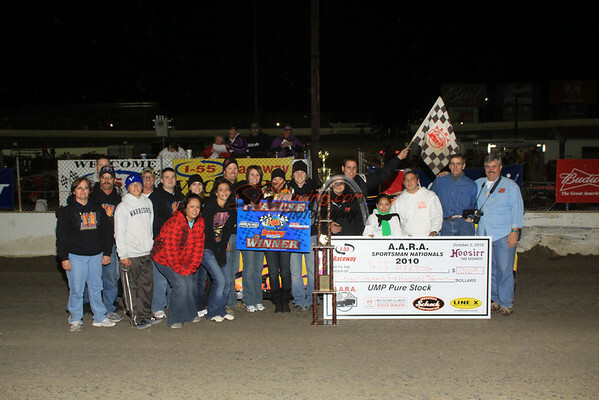 Jeff Herzog claims Sportsman Fall Dirt Nationals at I-55 Raceway & earns $7,500 payday! Pevely, MO (October 2nd, 2010) A huge field of UMP DIRTcar/AARA Sportsman cars were on hand for the 9th Annual Bud Pohle Memorial Fall Sportsman Nationals. Fifty nine of some of the best Sportsman cars in the Midwest came ready to battle for the big money that was on the line. It was I-55 Raceway’s own Jeff Herzog that would get the big bucks as he became the ninth different winner of the event. Herzog took the lead at the drop of the green flag from his outside front row starting spot and proceeded to lead all fifty laps of the main event. With huge lap money on the line (minimum $100 to lead each lap with several laps paying $250 and $500 to lead), Herzog went home with a $7,500 payday at the end of fifty laps when combining the lap money with the winner’s purse. Trey Harris stayed glued to Herzog’s rear bumper for all fifty laps, but couldn’t make a move to get along side Herzog for the top spot. Herzog’s only glitch came early in the event as the car of Jeff LeBaube slowed with mechanical problems. Herzog would get into the rear of LeBaube’s car as he tried to get to the low side to get off the track. However, officials waved the caution for LeBaube slowing and Herzog retained his position at the top spot. Herzog would be nearly flawless for the rest of the event and hold off Harris lap after lap en-route to the win. Steve Edgecombe and Russell Eilers had a great battle for the third spot, the two swapped the position around lap after lap during the final twenty laps of the main event. Edgecombe would edge out Eilers at the end to get the third spot with Eilers taking fourth. Gary Haynes’ late charge to the front would net him a top five finish as he came home fifth. Russell Eilers would pace the entire 8 laps of the Hoosier Tire Championship Dash to take the victory. This event is for area track champions as well as past winners of the Bud Pohle Memorial.